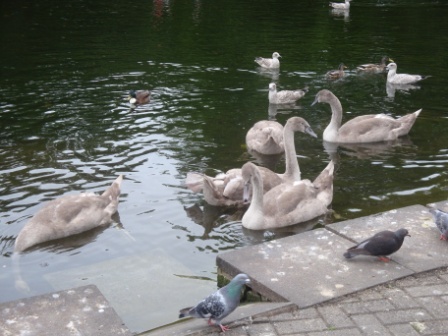 It’s rare that I don’t visit St. Stephen’s Green in Dublin whenever I’m in town. It’s such a peaceful haven in the middle of a metropolis. 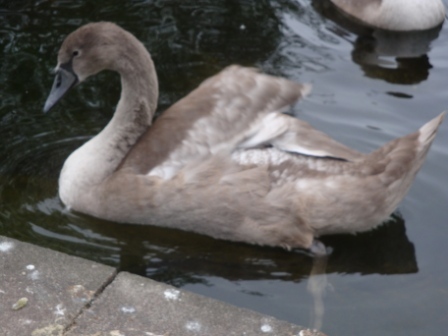 During two visits this month I was privileged to view a healthy group of cygnets. 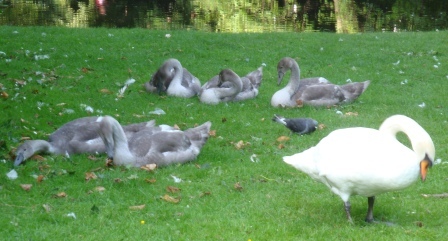 They are nearing maturity and you can see the grayish-brown starting to turn pristine white. Their beaks must be one of the last things that change from the adolescent all black to the bright orange of adulthood. I’m working on a novella involving a young girl from the early 1900’s who frequents the park and I come here for inspiration and to connect with her spirit for guidance to move the story along. Another in the long list of projects in varying stages of completion.